"You want to get rid of me? Here I am. Go ahead. Get rid of me." After the towering achievement of GoodFellas, Martin Scorsese reteamed with his co-writer from that film and embarked upon what in many ways is an unofficial sequel to that mob classic. Casino chronicles the last decade of Mafia-era Las Vegas, when organized crime began to slowly lose their pagan paradise and was sent home from Vegas like so many tourists: broken and crippled by the city's excesses. However, the themes of the film are far more sprawling than a documentation of crime. At its core, Scorsese's epic, like other great mob movies, is about the American Dream. In 1973, Sam "Ace" Rothstein (Robert De Niro) arrives from Chicago to manage the fictional Tangiers casino. The script by Nicholas Pileggi and Scorsese, based upon Pileggi's nonfiction book, does not follow a traditional three-act structure and it would be difficult for it do so. Carrying over the successful voiceover narration techniques from GoodFellas, the daily operations of the Strip's casinos and the characters are relayed to the audience by Sam and his bestfriend, Nicky Santoro (Joe Pesci), at lightning speed. At times overwhelming the senses, the narration works with swish-pans and stunning Steadicam shots to reveal practically every detail about the social structure of Vegas' underworld. Even if the exact relationships between crooked security guards, mob bosses, parking valets, and showgirls passes by, the underlying idea is clear that Vegas is a land of kickbacks. As long as Sam keeps other people happy, he'll be allowed to run the casino without drawing suspicion from the authorities. The Mafia's front man, Philip Green (Kevin Pollak), may sign official documents, but it is Sam who makes things work. Sam's ingenuity and perfectionist job performance makes everybody very happy, since his various innovations practically double an already billion-dollar empire's cash flow. 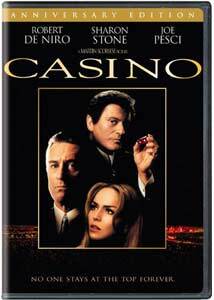 Yet as skilled and reserved as Sam is in the casino, he takes a risk on the beautiful hustler Ginger McKenna (Sharon Stone) when they marry. Ginger's lust for material fortune and demand for independence do not mesh well with Sam's domineering personality. Compounding his personal problems, Nicky's hyper-violent crimes begin to draw heat down upon Sam as he attempts to obtain a gaming license. The film centers itself around the trio of Sam, Nicky, and Ginger over a period of ten years. Although those three characters are the leads, many notable supporting characters enhance the ambience of the film—particularly Sam's right-hand man, Bill Sherbert (Don Rickles), and Ginger's former pimp, Lester Diamond (James Woods)—and it would be impossible to convey all the interlocking relationships that play an important role in this film in a review. What originally might seem like an irrelevant scene can take on immeasurable importance later, such as when Sam fires an incompetent employee and refuses his brother-in-law's request to hire the man back. The greatest accomplishment of Scorsese's direction here is how he manages to keep the viewer entertained during the film's 178-minute running time and prevents the vast array of characters from confusing the audience. Even though the scope of the script is quite ambitious in its efforts to explain the dynamics of a casino, the cover-up by the Mafia, and the relationship between legitimate and illegitimate businesses, there's a great human element thanks to the three leading performers. De Niro's quiet, understated performance as Sam carries tremendous weight and makes the scenes where Sam orders violent punishments to cheaters all the more chilling. While Pesci's performance may be leftover from his brilliant turn in GoodFellas, it still makes for a delicious feast. The fire and intensity he brings to the role of Nicky, particularly when Nicky squeezes a man's head in a vice, are never merely that of a monster. Due to Pesci's work, the audience can see Nicky as a human being—albeit a very dangerous one—and there's a certain degree of empathy I feel towards him as he moves closer and closer to a grave of his own making. While De Niro and Pesci may not be turning in surprising work (after all, they're both familiar to this genre), Sharon Stone's performance as Ginger is the highlight of her career. She truly seems to be living every emotion of that part, conveying eloquently the depression, anger, and fear of Ginger in a role that could easily have been overacted. The actors have a great opus on which to make their mark, with Casino actually being superior to GoodFellas on a technical level. Dante Ferretti's recreation of 1970s Las Vegas is breathtakingly perfect, as he designs sets with his trademark attention to detail. The costumes by Rita Ryack and John Dunn also convey the time period, but go a long way in revealing character traits. Notice how Ginger is nearly always wearing leather to suggest her snake-like prowess or how Sam wears flashy designer suits. The use of costumes helps convey a great deal of character development without requiring extensive pieces of exposition. However, it is the work of cinematographer Robert Richardson and editor Thelma Schoonmaker that bring the technical accomplishments together. Richardson's patented hot lighting, creating a glow around the actors, makes every frame radiant. His slick, stylish shooting is perfect for Vegas and makes Casino one of the most dazzling movies you'll ever see. Blending the images together is Schoonmaker's editing, which sustains the viewer's attention over the film's long running time and makes this one of the fastest three-hour movies I've ever seen. However, while Casino may signify a new level of technical accomplishment in Scorsese's career, it is not a leap forward thematically. Although the heart of the film is a genuinely interesting story about crime and the dynamics of such a life, the glitter of Vegas seems to keep Scorsese from developing a new point-of-view on the subject. Much of what is touched upon here is not terribly different than Mean Streets and the touching, deeply human heartbreak of that film is lost in Scorsese's compulsive attention to detail. Perhaps it is unreasonable to think that Scorsese could go even further into the world of organized crime than he already has, but there are moments where it feels like he's repeating himself. There's a magnificent tracking shot following a man skimming money from the casino's count room, but you'll find essentially the same shot in GoodFellas. Moreover, although the drama plays out on a far grander stage, the story is more or less the same as many other crime pictures. It still works beautifully and engages your attention, but the script seems content merely to move the action from New York to Las Vegas and hope we won't realize that it's the same essential story. Yet, the sure-handed direction by Scorsese rises above that noticeable pitfall, utilizing his cast and crew well as he tells a familiar, entertaining fable about the Mafia's rise and fall from power. By no means is this a masterpiece, but the acting and craftsmanship are the best action you'll get off the Strip. Image Transfer Review: Although the back cover of the DVD claims that this is an "all-new digitally remastered picture" I cannot tell much difference between this and the previous DVD release. Print defects are noticeable throughout, but do not distract. There's also are some bits of dirt that appear on occasion. However, on the whole this is a solid transfer with strong detail, remarkable contrast, and a great deal of depth. It isn't perfect by a long shot, but the cinematography still comes across nicely. Audio Transfer Review: Remember from the previous DVD release when Nicky and Sam are arguing in the desert? There's an annoying audio glitch when Nicky speaks and I regret to inform you that it still remains. Thus, this is the same sound mix from the original DVD and is not as engaging as one would hope. There's still a heft amount of rear-channel activity due to the musical soundtrack, but there isn't a great deal of range in the mix. Sound separation and directionality do kick in from time to time, but nearly as often as I had hoped. Nonetheless, the dialogue is always audible and the voice-over is well balanced within the mix. Spanish and French Dolby Digital 5.1 mixes are also available. Extras Review: The double-sided disc contains the film and an audio commentary on the first side. The commentary (which for some reason is labeled as "moments with") features producer Barbara De Fina, co-screenwriter Nicholas Pileggi, co-costume designer Rita Ryack, editor Thelma Schoonmaker, director/co-screenwriter Martin Scorsese, actress Sharon Stone, and actor Frank Vincent (who plays Frank Marino in the movie). It is fairly obvious that none of the people are actually watching the movie as they speak, but rather that this is an assemblage of interview sound bytes being mixed together. A narrator introduces each speaker, which helps in keeping the different voices distinguished for those who aren't familiar with the participants. On the whole, this is a pretty solid commentary and each person gets ample time to discuss his or her thoughts about the project. Nobody dominates the track, but Pileggi and Scorsese offer the best information. A nice element of this feature is that it not only covers anecdotes and ideas about the movie, but also gives plenty of insight into the true story on which it is based. On the flip side of the disc there is a variety of documentaries and featurettes about the film. Casino: The Story (08m:15s) consists of interviews with Pileggi, Scorsese, and others about the process of writing the script. The interviews here are easily identified as the same interviews used to compose the commentary, so there is a lot of repeated material. However, not everything is recycled and the discussion about writing the script while also writing the book is worth listening to. Following that is the documentary Casino: The Cast and Characters (19m:59s), which contains interviews with Scorsese and Stone, but also some archival interviews from the premiere with De Niro and Pesci. Again, much of this is a repeat from the commentary but it isn't entirely redundant and contains some footage from the set—including the antics of Don Rickles. The next documentary, Casino: The Look (16m:35s) is largely new material, consisting of interviews with Scorsese, production designer Dante Ferretti, and others. Ferretti recalls his research process of designing the sets and the difficulty of finding good locations. This is a very interesting extra. Following that is Casino: After the Filming (09m:21s) in which the cast and crew discuss the original lackluster reception the film received and its reemergence at the hands of youthful film buffs. There's also some discussion about the editing process and Scorsese likens his tale to the fate of Hollywood directors from the 1970s. Like the ones before it, this extra's interviews are the same used for the commentary track. In addition to those extras there also are four deleted scenes. Playing together in nonanamorphic 2.35:1 widescreen, the scenes are unfinished and combine for a total run time of three minutes, one second. Truthfully, these aren't deleted scenes but rather are extended scenes of the actors speaking—and the last one is actually just an outtake of Don Rickles making a joke. However, there is one last featurette, Vegas and the Mob (13m:41s), from NBC news with Josh Mankiewicz as the host. Featuring an interview with Vegas' mayor Oscar Goodman, who defended the real Nicky Santoro in court, this gives a brief, interesting history of the mob's role in Las Vegas. It's too brief to give a vivid portrait, but it's well worth a viewing. There's also a final documentary, History Alive: True Crime Authors: Casino with Nicholas Pileggi (43m:47s). Originally broadcast on the History Channel, this documentary tells the real story of Frank "Lefty" Rosenthal on which the movie is based. Much of the major events are the same as in the movie, but some of the dynamics and relationships are different. Featuring an interview with Frank Rosenthal, this is an excellent addition to the DVD. Rounding out the extras are the production notes from the original DVD release, which touch upon a great deal of information about the hectic shooting schedule. Those who have the original DVD release should be informed that the original theatrical trailer is not included on this set, but instead there are trailers for The Big Lebowski: Special Edition DVD, Assault on Precinct 13 DVD and VHS, and Northern Exposure: Seasons 1-3 DVDs. Gripping and beautiful, Casino is a stunning piece of filmmaking even if it is a lot of technical virtuoso being put to a story you've seen before. This anniversary edition DVD recycles the flawed sound transfer and the picture is far from perfect, but a collection of impressive extras makes up for it. Definitely worth the double dip.